I went home to my three small children and told my hubby about it. I was 26 years old. I told no one else and we literally forgot all about that encounter as we raised children and grew in the Lord. He did just what I asked Him to do. Every day I ask Him what His people need to hear and He speaks. As long as He leads I will write. I am merely the typist to the Lord. 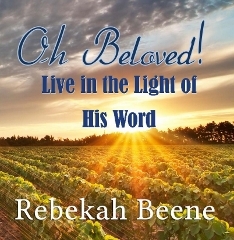 Oh Beloved, Live in the Light of His Word is a compilation of the devotionals written originally for my online friends. My prayer is that people will realize how much God loves them. For to love Him is to trust Him. And when you trust God, everything changes. He is Your All In All and He is always available, an Ever Present Help in Time of Need. 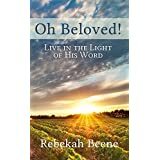 For more information or speaking engagements you can contact me at rebekah.beene@hotmail.com Feel free to share the Devotionals and let me know.